Lemon bakes aren’t groundbreaking at all. But I am sure you will whole-heartedly accept a new recipe from a lemon lover sucker such as me! I go bananas over lemon cakes, lemon-cupcakes, lemon cake-pops or lemon pie. You name it! Oh how about combining bananas and lemon zest together in a muffin? Would you love it? I am starting to get 23458 ideas right now! I have made some substitutions to the existing recipe to make it more softer, more fluffier and extremely moist in every bite. Not that the original one was lacking all of the above or anything. It’s just I wanted to eat the best lemon cupcakes on the entire planet! These classic cupcakes shine brighter than any other recipes! What weaves this magic? Let us find out. Substituted butter with oil- This adds a ton of moisture in the baked goods. Added butter extract to overcome the flavor loss- What a cupcake with oil misses in terms of that buttery flavor, is compensated by the addition of butter extract. Replaced all purpose flour with cake flour- This produces the most soft and fluffy baked good you can ever experience! Whipped yolks and whites separately- Now egg whites create a ton of volume in the batter to yield super light and fluffy bake. This was a no-brainer. Okay! Enough chemistry lessons! Lets see how are we making these cupcakes. The regular sugar, flour, oil, some baking powder and salt for dry ingredients! Beat the egg whites and the wet ingredients separately. Mix dry into wet. Fold in the egg meringue and bake! Cool the cupcakes upside down to avoid these sinking down in the middle! I know what you are thinking! Lets get right into it. ♥The frosting isn’t tart or sour to taste. Just a perfect blend of sweet refreshing citrus flavor with a hint of vanilla. ♥Yet the frosting is soft and smooth enough to melt in your mouth. I decided to keep my icing white. You may add a drop of lemon color if you desire. The recipe is so easy and requires only pantry friendly ingredients. You won’t even need to make a special visit to the market to whip these up! Don’t want so much lemon in your cupcakes? 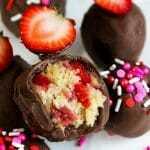 Try my real strawberry frosting on these! Insanely delicious. Feeling lazy to pipe the frosting? Slather them with my creamy blackberry glaze! Tread in sunny lemon fields with these bright lemon cupcakes with lemon frosting. These hide a ton of flavor, softness and fluffiness inside! 1. Preheat your oven to 350 deg F and line a baking pan with 12 paper liners. Set aside. 2. Beat the egg whites with 1/2 cup of sugar in a large mixing bowl, till stiff peaks stage. Set it aside too. 3. Mix yolks, lemon zest, lemon juice, oil. vanilla, salt and the remaining sugar in a medium mixing bowl. 3. Add sifted cake flour and baking powder to this mixture alternating with milk in three additions. 4. Fold in egg whites in the batter. Take care not to overmix. Distribute the batter in the liners and bake for about 20-22 minutes. 5. Take them out once done and allow these to cool down completely inverted. As they might shrink a little. 1. Pour cool whipping cream in chilled bowl, add sugar, cornstarch and whip until soft peak stage. 2. Now incorporate lemon juice and vanilla to the cream. Mix just until combined. 3. Keep the cream in fridge till ready to use, Frost as desired. 4. Decorate with lemon slices and mint sprigs. →Frost lemon cupcakes when cooled completely. →You must store lemon frosting in the refrigerator until ready to use. →Store unfrosted cupcakes in the freezer (covered tightly) for 2-3 months if desired. →You may store frosted cupcakes (covered tightly) in the refrigerator for 2-4 days. Those are delightful. And great tips for getting extra lightness. Beautiful. Thanks for your kind words Neil! I am honored. Particularly when my pictures are devoid of good lighting! :I Btw Happy Easter and happy Spring days to you. Perfect announcing the spring ! hey, I wonder… would replacing the whipping cream with scraped coconut work? I’m not the perfect chef in the kitchen so I’m asking you.. I haven’t tried it ever. Whipped cream works best for a pipeable consistency. 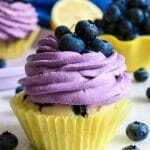 Never tried this type of Lemon cup cakes, so yummy. Photography of the cup cakes is really high quality looks beautiful. I have no doubt these were a hit! And I loved your tips! Did I miss something? You talk about replacing the butter with oil, then adding butter extract to replace the butter flavor, however there is no mention of butter extract in the recipe. Looking forward to making this recipe.